The environmental impact of aviation occurs because aircraft engines emit heat, noise, particulates and gases which contribute to climate change and global dimming. Among others airplanes emit particles and gases such as carbon dioxide (CO2), water vapor, hydrocarbons, carbon monoxide, nitrogen oxides, sulfur oxides and black carbon which interact among themselves and with the atmosphere. Despite emission reductions from automobiles and more fuel-efficient and less polluting turbofan and turboprop engines, the rapid growth of air travel in recent years contributes to an increase in total pollution attributable to aviation. From 1992 to 2005, passenger kilometers increased 5.2% per year. And in the European Union, greenhouse gas emissions from aviation increased by 87% between 1990 and 2006. Comprehensive research shows that despite anticipated efficiency innovations to airframes, engines, aerodynamics and flight operations, there is no end in sight – even many decades out – to rapid growth in CO2 emissions from air travel and air freight, due to projected continual growth in air travel. This is because aviation emissions have escaped international regulation thus far, and because the lack, worldwide, of taxes on aviation fuel results in lower fares than otherwise which gives a competitive advantage over other transportation modes. Unless market constraints are put in place this growth in aviation's emissions will result in the sector's emissions amounting to all or nearly all of the annual global CO2 emissions budget by mid-century, if climate change is to be held to a temperature increase of 2 °C or less. Like all human activities involving combustion, most forms of aviation release carbon dioxide (CO2) and other greenhouse gases into the Earth's atmosphere, contributing to the acceleration of global warming and (in the case of CO2) ocean acidification. These concerns are highlighted by the present volume of commercial aviation and its rate of growth. Globally, about 8.3 million people fly daily (3 billion occupied seats per year), twice the total in 1999. U.S. airlines alone burned about 16.2 billion gallons of fuel during the twelve months between October 2013 and September 2014. In addition to the CO2 released by most aircraft in flight through the burning of fuels such as Jet-A (turbine aircraft) or Avgas (piston aircraft), the aviation industry also contributes greenhouse gas emissions from ground airport vehicles and those used by passengers and staff to access airports, as well as through emissions generated by the production of energy used in airport buildings, the manufacture of aircraft and the construction of airport infrastructure. While the principal greenhouse gas emission from powered aircraft in flight is CO2, other emissions may include nitric oxide and nitrogen dioxide (together termed oxides of nitrogen or NOx), water vapour and particulates (soot and sulfate particles), sulfur oxides, carbon monoxide (which bonds with oxygen to become CO2 immediately upon release), incompletely burned hydrocarbons, tetraethyllead (piston aircraft only), and radicals such as hydroxyl, depending on the type of aircraft in use. Emissions weighting factor (EWFs) i.e., the factor by which aviation CO2 emissions should be multiplied to get the CO2-equivalent emissions for annual fleet average conditions is in the range 1.3–2.9. CO2 emissions from aircraft-in-flight are the most significant and best understood element of aviation's total contribution to climate change. The level and effects of CO2 emissions are currently believed to be broadly the same regardless of altitude (i.e. they have the same atmospheric effects as ground based emissions). In 1992, emissions of CO2 from aircraft were estimated at around 2% of all such anthropogenic emissions, and that year the atmospheric concentration of CO2 attributable to aviation was around 1% of the total anthropogenic increase since the industrial revolution, having accumulated primarily over just the last 50 years. 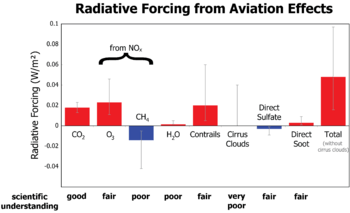 At the high altitudes flown by large jet airliners around the tropopause, emissions of NOx are particularly effective in forming ozone (O3) in the upper troposphere. High altitude (8–13 km) NOx emissions result in greater concentrations of O3 than surface NOx emissions, and these in turn have a greater global warming effect. The effect of O3 concentrations are regional and local (as opposed to CO2 emissions, which are global). One of the products of burning hydrocarbons in oxygen is water vapour, a greenhouse gas. Water vapour produced by aircraft engines at high altitude, under certain atmospheric conditions, condenses into droplets to form Condensation trails, or contrails. Contrails are visible line clouds that form in cold, humid atmospheres and are thought to have a global warming effect (though one less significant than either CO2 emissions or NOx induced effects). Contrails are extremely rare from lower-altitude aircraft, or from propeller-driven aircraft or rotorcraft. Cirrus clouds have been observed to develop after the persistent formation of contrails and have been found to have a global warming effect over-and-above that of contrail formation alone. There is a degree of scientific uncertainty about the contribution of contrail and cirrus cloud formation to global warming and attempts to estimate aviation's overall climate change contribution do not tend to include its effects on cirrus cloud enhancement. However, a 2015 study found that artificial cloudiness caused by contrail "outbreaks" reduce the difference between daytime and nighttime temperatures. The former are decreased and the latter are increased, in comparison to temperatures the day before and the day after such outbreaks. On days with outbreaks the day/night temperature difference was diminished by about 6F° in the U.S. South and 5F° in the Midwest. These emissions are similar to a four-seat car with one person on board; however, flying trips often cover longer distances than would be undertaken by car, so the total emissions are much higher. For perspective, per passenger a typical economy-class New York to Los Angeles round trip produces about 715 kg (1574 lb) of CO2 (but is equivalent to 1,917 kg (4,230 lb) of CO2 when the high altitude "climatic forcing" effect is taken into account). Within the categories of flights above, emissions from scheduled jet flights are substantially higher than turboprop or chartered jet flights. About 60% of aviation emissions arise from international flights, and these flights are not covered by the Kyoto Protocol and its emissions reduction targets. Figures from British Airways suggest carbon dioxide emissions of 100g per passenger kilometre for large jet airliners (a figure which does not account for the production of other pollutants or condensation trails). The A380 is marketed as a "green giant" and one of the most environmentally advanced aircraft out there. But that spin is based on a maximum-capacity aircraft configuration, or about 850 economy passengers. In reality, a typical A380 aircraft has 525 seats. Its fuel performance is comparable to that of a B747-400 ER and even about 15% worse than a B777-300ER on a passenger-mile basis (calculated using Piano-5 on a flight from AUH to LHR, assuming an 80% passenger load factor, and in-service fleet average seat counts). 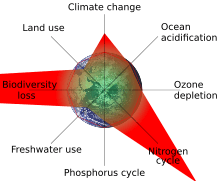 In attempting to aggregate and quantify the total climate impact of aircraft emissions the Intergovernmental Panel on Climate Change (IPCC) has estimated that aviation's total climate impact is some 2-4 times that of its direct CO2 emissions alone (excluding the potential impact of cirrus cloud enhancement). This is measured as radiative forcing. While there is uncertainty about the exact level of impact of NOx and water vapour, governments have accepted the broad scientific view that they do have an effect. Globally in 2005, aviation contributed "possibly as much as 4.9% of radiative forcing." UK government policy statements have stressed the need for aviation to address its total climate change impacts and not simply the impact of CO2. 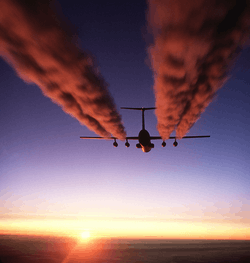 The IPCC has estimated that aviation is responsible for around 3.5% of anthropogenic climate change, a figure which includes both CO2 and non-CO2 induced effects. The IPCC has produced scenarios estimating what this figure could be in 2050. The central case estimate is that aviation's contribution could grow to 5% of the total contribution by 2050 if action is not taken to tackle these emissions, though the highest scenario is 15%. Moreover, if other industries achieve significant cuts in their own greenhouse gas emissions, aviation's share as a proportion of the remaining emissions could also rise. A December 2015 report finds that aircraft could generate 7013430000000000000♠43 Gt of carbon pollution through to 2050, consuming almost 5% of the remaining global climate budget. Without regulation, global aviation emissions may triple by mid-century and could emit more than 7012300000000000000♠3 Gt of carbon annually under a high-growth, business-as-usual scenario. Efforts to bring aviation emissions under an effective global accord have so far largely failed, despite there being a number of technological and operational improvements on offer. During the first three quarters of 2010, air travel markets expanded at an annualized rate approaching 10%. This is similar to the rate seen in the rapid expansion prior to the recession. November's results mean the annualized rate of growth so far in Q4 drops back to around 6%. But this is still in line with long run rates of traffic growth seen historically. The level of international air travel is now 4% above the pre-recession peak of early 2008 and the current expansion looks to have further to run. Air freight reached a new high point in May (2010) but, following the end of inventory restocking activity, volumes have slipped back to settle at a similar level seen just before the onset of recession. Even so, that means an expansion of air freight during 2010 of 5-6% on an annualized basis – close to historical trend. With the stimulus of inventory restocking activity removed, further growth in air freight demand will be driven by end consumer demand for goods which utilize the air transport supply chain. ... The end of the inventory cycle does not mean the end of volume expansion but markets are entering a slower growth phase. In a 2008 presentation and paper  Professor Kevin Anderson of the Tyndall Centre for Climate Change Research showed how continued aviation growth in the UK threatens the ability of that nation to meet CO2 emission reduction goals necessary to contain the century-end temperature increase to even 4 or 6C°. (See also: the 4 Degrees and Beyond International Climate Conference (2009) and its proceedings.) His charts show the projected domestic aviation carbon emission increase for the UK as growing from 11 MT in 2006 to 17 MT in 2012, at the UK's historic annual emission growth rate of 7%. Beyond 2012 if the growth rate were reduced to 3% yearly, carbon emissions in 2030 would be 28 MT, which is 70% of the UK's entire carbon emissions budget that year for all sectors of society. This work also suggests the foreseeable future which confronts many other nations that have high dependency on aviation. "Hypermobile Travelers," an academic study by Stefan Gössling et al. (2009) in the book "Climate Change and Aviation," also points to the dilemma caused by the increasing hypermobility of air travelers both in particular nations and globally. While it is true that late model jet aircraft are significantly more fuel efficient (and thus emit less CO2 in particular) than the earliest jet airliners, new airliner models in the first decade of the 21st Century were barely more efficient on a seat-mile basis than the latest piston-powered airliners of the late 1950s (e.g. Constellation L-1649-A and DC-7C). Claims for a high gain in efficiency for airliners over recent decades (while true in part) has been biased high in most studies, by using the early inefficient models of jet airliners as a baseline. Those aircraft were optimized for increased revenue, including increased speed and cruising altitude, and were quite fuel inefficient in comparison to their piston-powered forerunners. Today, turboprop aircraft – probably in part because of their lower cruising speeds and altitudes (similar to the earlier piston-powered airliners) compared to jet airliners – play an obvious role in the overall fuel efficiency of major airlines that have regional carrier subsidiaries. For example, although Alaska Airlines scored at the top of a 2011-2012 fuel efficiency ranking, if its large regional carrier – turbo-prop equipped Horizon Air – were dropped from the lumped-in consideration, the airline's ranking would be somewhat lower, as noted in the ranking study. Aircraft manufacturers are striving for reductions in both CO2 and NOx emissions with each new generation of design of aircraft and engine. While the introduction of more modern aircraft represents an opportunity to reduce emissions per passenger kilometre flown, aircraft are major investments that endure for many decades, and replacement of the international fleet is therefore a long-term proposition which will greatly delay realizing the climate benefits of many kinds of improvements. Engines can be changed at some point, but nevertheless airframes have a long life. Moreover, rather than being linear from one year to the next the improvements to efficiency tend to diminish over time, as reflected in the histories of both piston and jet powered aircraft. Another proposed change is the integrating of an Electromagnetic Aircraft Launch System to the airstrips of airports. Some companies such as Airbus are currently researching this possibility. The adding of EMALS would allow the civilan aircraft to use considerably less fuel (as a lot of fuel is spend during take off, and in comparison, less during flight – when calculated per km flown). The idea is to have the aircraft take off at regular aircraft speed, and only use the catapult for take-off, not for landing. Other opportunities arise from the optimisation of airline timetables, route networks and flight frequencies to increase load factors (minimise the number of empty seats flown), together with the optimisation of airspace. However, these are each one-time gains, and as these opportunities are successively fulfilled, diminishing returns can be expected from the remaining opportunities. Another possible reduction of the climate-change impact is the limitation of cruise altitude of aircraft. This would lead to a significant reduction in high-altitude contrails for a marginal trade-off of increased flight time and an estimated 4% increase in CO2 emissions. Drawbacks of this solution include very limited airspace capacity to do this, especially in Europe and North America and increased fuel burn because jet aircraft are less efficient at lower cruise altitudes. In December 2011, the FAA announced it is awarding $7.7 million to eight companies to advance the development of drop-in commercial aviation biofuels, with a special focus on ATJ (alcohol to jet) fuel. As part of its CAAFI (Commercial Aviation Alternative Fuel Initiative) and CLEEN (Continuous Lower Emissions, Energy and Noise) programs, the FAA plans to assist in the development of a sustainable fuel (from alcohols, sugars, biomass, and organic matter such as pyrolysis oils) that can be "dropped in" to aircraft without changing current infrastructure. The grant will also be used to research how the fuels affect engine durability and quality control standards. Finally, liquified natural gas is another fuel that is used in some airplanes. Besides the lower GHG emissions (depending from where the natural gas was obtained from), another major benefit to airplane operators is the price, which is far lower than the price for jet fuel. The German video short The Bill explores how travel and its impacts are commonly viewed in everyday developed-world life, and the social pressures that are at play. British writer George Marshall has investigated common rationalizations that act as barriers to making personal choices to travel less, or to justify recent trips. In an informal research project, "one you are welcome to join," he says, he deliberately steered conversations with people who are attuned to climate change problems to questions about recent long-distance flights and why the travel was justified. Reflecting on actions contrary to their beliefs, he noted, "(i)ntriguing as their dissonance may be, what is especially revealing is that every one of these people has a career that is predicated on the assumption that information is sufficient to generate change – an assumption that a moment's introspection would show them was deeply flawed." For example, by 2003 Access Grid technology has already been successfully used to host several international conferences, and technology has likely progressed substantially since then. The Tyndall Centre for Climate Change Research has been systematically studying means to change common institutional and professional practices that have led to large carbon footprints of travel by research scientists, and issued a report. (Le Quéré et al. 2015). The UK study Predict and Decide – Aviation, climate change and UK policy, notes that a 10% increase in fares generates a 5% to 15% reduction in demand, and recommends that the British government should manage demand rather than provide for it. This would be accomplished via a strategy that presumes "… against the expansion of UK airport capacity" and constrains demand by the use of economic instruments to price air travel less attractively. A study published by the campaign group Aviation Environment Federation (AEF) concludes that by levying £9 billion of additional taxes, the annual rate of growth in demand in the UK for air travel would be reduced to 2%. The ninth report of the House of Commons Environmental Audit Select Committee, published in July 2006, recommends that the British government rethinks its airport expansion policy and considers ways, particularly via increased taxation, in which future demand can be managed in line with industry performance in achieving fuel efficiencies, so that emissions are not allowed to increase in absolute terms. Greenhouse gas emissions from fuel consumption in international aviation, in contrast to those from domestic aviation and from energy use by airports, are excluded from the scope of the first period (2008-2012) of the Kyoto Protocol, as are the non-CO2 climate effects. Instead, governments agreed to work through the International Civil Aviation Organization (ICAO) to limit or reduce emissions and to find a solution to the allocation of emissions from international aviation in time for the second period of the Kyoto Protocol starting from 2009; however, the Copenhagen climate conference failed to reach an agreement. Recent research points to this failure as a substantial obstacle to global policy including a CO2 emissions reduction pathway that would avoid dangerous climate change by keeping the increase in the average global temperature below a 2 °C rise. In October 2016 the UN agency International Civil Aviation Organization (ICAO) finalized an agreement among its 191 member nations to address the more than 7011458000000000000♠458 Mt (2010) of carbon dioxide emitted annually by international passenger and cargo flights. The agreement will use an offsetting scheme called CORSIA (the Carbon Offsetting and Reduction Scheme for International Aviation) under which forestry and other carbon-reducing activities are directly funded, amounting to about 2% of annual revenues for the sector. Rules against 'double counting' should ensure that existing forest protection efforts are not recycled. The scheme does not take effect until 2021 and will be voluntary until 2027, but many countries, including the US and China, have promised to begin at its 2020 inception date. Under the agreement, the global aviation emissions target is an 80% reduction by 2035 relative to 2020. NGO reaction to the deal was mixed. A report published in the science journal Nature Climate Change forecasts that increasing CO2 levels will result in a significant increase in in-flight turbulence experienced by transatlantic airline flights by the middle of the 21st century. The lead author of the study, Paul Williams, a researcher at the National Center for Atmospheric Science, at the University of Reading stated, "air turbulence does more than just interrupt the service of in-flight drinks. It injures hundreds of passengers and aircrew every year – sometimes fatally. It also causes delays and damage to planes." Aircraft noise is seen by advocacy groups as being very hard to get attention and action on. The fundamental issues are increased traffic at larger airports and airport expansion at smaller and regional airports. Flying 12 kilometres (39,000 ft) high, passengers and crews of jet airliners are exposed to at least 10 times the cosmic ray dose that people at sea level receive. Several times a decade, a geomagnetic storm permits a solar particle event to penetrate down to jetliner altitudes. Aircraft flying polar routes near the geomagnetic poles are at particular risk. ↑ International Civil Aviation Organization, Air Transport Bureau (ATB). "Aircraft Engine Emissions". Retrieved 2008-03-19. ↑ Enviro.aero. "What is the impact of flying?". Retrieved 2008-03-19. ↑ Guy Brasseur et al. : Impact of aviation on climate. FAA's Aviation Climate Change Research Initiative (ACCRI) Phase II. Bulletin of the American Meteorological Society 97, No. 4, 561-584, doi:10.1175/BAMS-D-13-00089.1. ↑ Boeing (2014). Current Market Outlook, 2014-2033. ↑ Airbus (2015). Flying by Numbers: Global Market Forecast 2015-2034. 1 2 Anderson, K. (17 June 2008). Reframing climate change: from long-term targets to emission pathways (esp. slide 24 onward). ↑ Why airfare keeps rising despite lower oil prices, by Scott Mayerowitz, Assoc. Press Airlines Writer. Houston Chron., 17 November 2014. ↑ Horvath A, Chester M (2008). Environmental Life-cycle Assessment of Passenger Transportation An Energy, Greenhouse Gas and Criteria Pollutant Inventory of Rail and Air Transportation. Info: University of California Transportation Center, UC Berkeley. ↑ Jet contrails affect surface temperatures. Science Daily. 18 June 2015. ↑ "Questions & Answers on Aviation & Climate Change". European Commission. 2005-09-17. Retrieved 2008-01-12. ↑ Nevins, Joseph (2010, 13-Dec), Kicking the Habit: Air Travel in the Time of Climate Change. 1 2 Owen B, Lee DS, Lim L, 2010/04/01 P- (2010). Flying into the Future: Aviation Emissions Scenarios to 2050. Environmental Science & Technology (44:7, p.2255-2260). 1 2 Bofinger, H.; Strand, J. (2013). Calculating the carbon footprint from different classes of air travel. World Bank, Development Research Group, Env. & Energy Team. 40pp. May 2013. ↑ Washington Post (2013). How the World Bank could slash its carbon emissions: Start flying coach. By Howard Schneider, 13 June 2013. 1 2 ICCT (2013). Inflight Luxury: Who Really Pays?. By Irene Kwan. Int'l Counc. on Clean Transport. ↑ The Future of Air Transport White Paper (2003), HMSO "The aviation industry is encouraged to take account of, and where appropriate reduce, its contribution to global warming...The impact of aviation on climate change is increased over that of direct CO2 emissions alone by some of the other emissions released and their specific effects at altitude". ↑ "New Report: Airplane Pollution Jeopardizes Paris Climate Goals" (Press release). Tucson, AZ, USA: Center for Biological Diversity. 2 December 2015. Retrieved 2016-10-13. ↑ Paradee, Vera (December 2015). Up in the air: how airplane carbon pollution jeopardizes global climate goals (PDF). Tucson, AZ, USA: Center for Biological Diversity. Retrieved 14 October 2016. 1 2 IATA (2010, Nov.) Air Transport Market Analysis Accessed: 23 January 2011. ↑ IATA/ATAG, Aviation & the Environment (1999) "Aircraft fuel efficiency has improved by some 50% over the past 30 years"
1 2 3 4 Peeters P.M., Middel J., Hoolhorst A. (2005). Fuel efficiency of commercial aircraft — An overview of historical and future trends. National Aerospace Laboratory. NLR-CR-2005-669, 37pp. ↑ Back to the Future: Return of the Turboprop?. By Irene Kwan. Int'l Counc. on Clean Transport. 3 June 2014. ↑ Advisory Council for Aeronautical Research in Europe (ACARE) Strategic Research Agenda (2002) "These objectives include, inter alia, a 50% cut in CO2 and 80% in Nox emissions" [for new aircraft introduced in 2020 relative to new aircraft introduced in 2000]. 1 2 Timmis, A.; Hodzic, A.; Koh, L.; Bonner, M.; Soutis, C.; Schafer, A.; Dray, L. (2014). "Environmental impact assessment of aviation emission reduction through the implementation of composite materials". The International Journal of Life Cycle Assessment. 20: 233–243. doi:10.1007/s11367-014-0824-0. ↑ Fuel Cell-powered Electric Nose Wheel Nears Flight Tests, EV World, 9 Feb 2011. ↑ Tests prove electric-drive concept, Flight Global 9 Aug 2005. ↑ Williams; Robert B. Nolanda, Victoria; Ralf Toumib (November 2002). "Reducing the climate change impacts of aviation by restricting cruise altitudes" (PDF). Transportation Research Part D: Transport and Environment. 7 (6): 451–464. doi:10.1016/S1361-9209(02)00013-5. Retrieved 2014-01-07. 1 2 3 CBC News (February 2008). "Airline flies jumbo jet powered by biofuel". Retrieved 2008-02-24. ↑ South Dakota State University (2006). "Active Projects". Archived from the original on 2007-09-28. Retrieved 2008-02-19. ↑ Ron Oxburgh. Through biofuels we can reap the fruits of our labours The Guardian, 28 February 2008. Retrieved 24 December 2008. ↑ Patrick Barta. As Biofuels Catch On, Next Task Is to Deal With Environmental, Economic Impact Wall Street Journal, 24 March 2008. Retrieved 24 December 2008. ↑ Air New Zealand Completes Biofuel Test GreenBiz.com, 5 January 2009. Retrieved 5 January 2009. ↑ Sustainable flight The Engineer Online, 12 January 2009. Retrieved 12 January 2009. ↑ Grady, Mary (December 2009). "Efforts Move Forward To Produce Alternative Aviation Fuels". Retrieved 2009-03-05. ↑ Purdue Research Park (December 2009). "Indiana Airline Fuel Developer Moves Ahead With Testing". Retrieved 2009-12-17. ↑ "50 Percent Biofuels Now Allowed in Jet Fuel". Renewable Energy World. 1 July 2011. ↑ Meg Cichon (2 December 2011). "FAA Awards $7.7 Million for Advancement of Aviation Biofuels". Renewable Energy World. ↑ "The Bill", by Peter Wedel, distributed by GermanWatch. 1 2 3 Reay DS (2004). New Directions: Flying in the face of the climate change convention. Atmospheric Environment (38:5, p.793-794). ↑ Le Quéré, C. et al. 2015. Towards a culture of low-carbon research for the 21st Century. Abstract page. ↑ Nudging Climate Scientists To Follow Their Own Advice On Flying. FiveThirtyEight. by Christie Aschwanden. 26 March 2015. 1 2 3 4 The Economist (2005, 20-Dec), Frequent-flyer miles — Funny money. ↑ UNEP DTIE (Sustainable Consumption & Production Branch)(undated). A Guide to Greenhouse Gas Emission Reduction in UN Organizations (DTI/1217/PA). pp.18-19. ↑ MedCaribbean.com. Making The Most Of Your Airlines Miles Credit Cards. 1 2 3 Storm, S. (1999). "Air transport policies and frequent flyer programmes in the European Community: a Scandinavian perspective". Unit of Tourism Research, Research Centre of Bornholm: 1–105. CiteSeerX 10.1.1.138.3305 . ↑ Cognac M, DeLozier M (1997)Frequent Flyer Programs Promotion: An Analysis Of A Paradoxical Industry. Southwestern Marketing Association (p.1-12). 1 2 Tretheway MW (1989) Frequent Flyer Programs: Marketing Bonanza or Anti-Competitive Tool? (30:1), p.445. ↑ Aftenpost (2002). Sterling polishes plans for new routes, by Nina Berglund, 19 Mar 2002. ↑ Cairns, Dr Sally & Carey Newson; et al. (September 2006). "Predict and decide — Aviation, climate change and UK policy" (PDF). pp. 96, section 11.9. Retrieved 2008-05-31. ↑ Cairns, Dr Sally & Carey Newson; et al. (September 2006). "Predict and decide — Aviation, climate change and UK policy" (PDF). p. 4. Retrieved 2008-05-31. ↑ Sewill, Brendon (February 2003). "The Hidden Cost of Flying" (PDF). Aviation Environment Federation. pp. 19–20. Retrieved 2007-10-18. ↑ GreenAirOnline (2009, 22-Dec). Copenhagen's failure to deliver an aviation emissions deal leaves sector facing an uncertain future. ↑ RTCC (2014). [Planes and ships escape scrutiny in bottom-up climate regime http://www.rtcc.org/2014/12/22/planes-and-ships-escape-scrutiny-in-bottom-up-climate-regime/]. Subtitle, "International aviation and shipping are not mentioned in the Lima call for climate action, despite growing emissions." 22 Dec. 2014. ↑ Bows, A.; Traut, M.; Gilbert, P.; Mander, S.; Walsh, C.; & Anderson, K. (2012). Aviation and shipping privileged – again? UK delays decision to act on emissions. Briefing Note No. 47; Tyndall Cent. for Clim. Chg. Research. Dec. 2012. ↑ Bows-Larkin, A (2014). "All adrift: aviation, shipping, and climate change policy". Clim. Policy: 1–22. doi:10.1080/14693062.2014.965125. ↑ ICAO news release 30 November 2005 "ICAO is also considering market-based options to address engine emissions through the participation of aviation in emissions trading schemes and the use of emissions levies related to local air quality. Guidelines for Contracting States wishing to implement such measures are being formulated and should be completed in time for the next regular Session of the ICAO Assembly in the Fall of 2007, when direction for future action will be set." ↑ Cames, Martin; Graichen, Jakob; Siemons, Anne; Cook, Vanessa (November 2015). "Emission Reduction Targets for International Aviation and Shipping" (PDF). European Parliament, Directorate-General for internal policies. p. 48. Retrieved 2016-11-10. ↑ "Fasten your seatbelts: Climate change to increase flight turbulence". RT News. 9 April 2013. Retrieved 29 December 2014. ↑ Noise Pollution Clearinghouse. "Aviation Noise". Retrieved 2007-12-29. "Air travel, climate change, and green consumerism". Appropedia. Stefan Gössling. "publications". Lund University — Department of Service Management and Service Studies. David S. Lee (Climatologist). "publications". ResearchGate. "Clearing the Air: The Myth and Reality of Aviation and Climate Change" (PDF). European Federation for Transport and Environment and Climate Action Network. 2006.